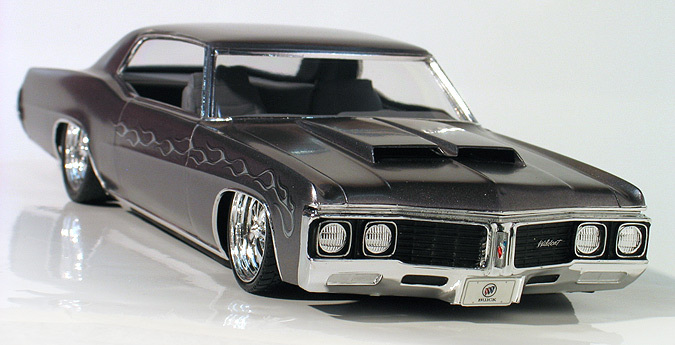 For the fourth version I built of the Model King '70 Buick Wildcat kit, I decided to build a contemporary custom with a Pro-Touring look. It's a pretty simple curbside build, but I did add a few custom modifications. First, I smoothed the big Buick's body by removing the door handles, side marker lights, emblems, trim and the side fender vents. I then rummaged through my parts box and found a custom hood scoop from a AMT '69 Chevelle SS kit and modified it to fit on the Buick's hood. It was too tall to begin with, but I ground down the bottom edges before attaching it to the Wildcat's hood which helped get the overall height down where I wanted it. Although Buick never placed any hood scoops on the Wildcat, the twin scoops remind me of the style used on the Olds 442. I think the scoops give the car a very powerful look without over powering the car and look as if they had came right out of a GM styling studio. 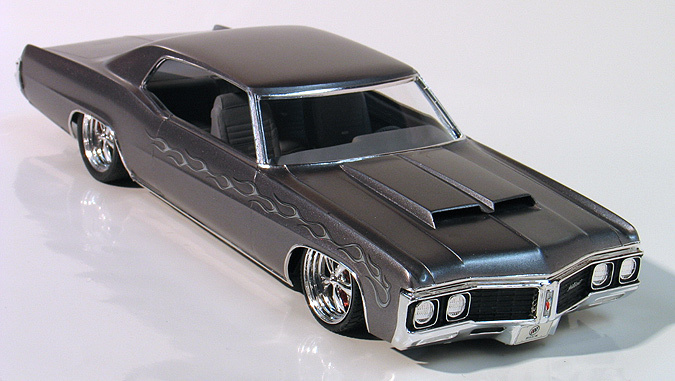 The paint is Tamiya medium gray metallic shot right from the rattle can. Initially, I was going to give it a clear coat but, after I starred at it a while the semi-flat finish of the Tamiya paint really grew on me so I decided to leave it as is. The interior paint is Dupli-color gray primer. The silver flame decals were ones I designed for the Model King re-issue of this kit and are included in the box. I think the subtle tone on tone effect of the flames and semi-gloss paint gives this Buick a modern european sort of flair. Pro-Touring cars need big wheels and brakes. These wheels are 20" Torq-Thrusts by Pegasus Hobbies. The front tires are the ones supplied with the wheels but I wanted to run a bigger diameter tire on the rear. I again went to my parts box and used a set of Monogram Corvette ZR-1 tires for the rear. The big wheels would have looked pretty empty without a nice set of brakes to fill the insides so I used the Brembo cross drilled rotors out of a Tamiya WRC Focus kit. Rather then trashing a whole kit just for the rotors, this time I made a silicone rubber mold and cast my own set from resin. Since I like to use these brakes often on models, it was worth it to me to go to the trouble of casting my own parts. The final touch was modifying the Buick's rear valance panel for the dual exhaust which I then added custom tips made from aluminum tubing.